BEFORE WE get started I�d like to say that if it were up to me, every 9-ball rack would be broken with a powerful break. I think the soft break, which is pretty commonplace these days, is a terrible development for the game. How exciting would it be if you went to Yankee Stadium and every batter tried to bunt? That being said, you might find yourself in a situation where the soft break gives you the best chance at winning a game, match or tournament. 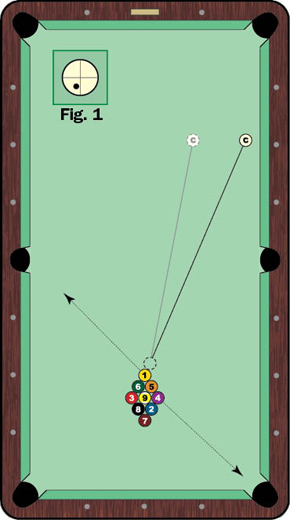 If you can break from anywhere behind the head string, place the cue ball along the long rail (as you can see in Diagram 1). Aim to hit the 1 ball as full as possible, using the same speed you would on a normal stop shot. You�re most likely to sink the near wing ball into the near corner pocket, like the 4 ball in the diagram. Also, the 1 ball should float toward the opposite side pocket. Ideally, you sink the wing ball, and the cue ball sits in the middle of the table with an angle on the 1. But what should you do if you�re limited to breaking in the box? You�ve got options if you need to break softly, but you have to change your approach a bit. You want to aim the cue ball at the same exact spot as before, which means you�ll be cutting the 1 ball slightly. This angle will cause the cue ball to rebound off the long rail. To keep control of the cue ball, hit it with some draw and left English, as shown in Fig. 1. (Use right English, if you�re breaking from the right side.) This will bring the cue ball up-table after hitting the side rail, so you should still be in position to drop the 1 if it stays up. Considering its popularity and effectiveness, the soft break is a necessary addition to your game. You don�t have to like it, but try it for yourself.